You’ve been a part of my thoughts for so long that I can’t even remember a time when I didn’t think of you. Are you the love of my life? I hope not. I thought, sincerely, fiercely, throughout my life, that the love of my life will be mutual. Isn’t that the definition of one’s love of their life? I remember everything. I remember your touch, your words, your text messages, your voice as it sounds over the phone, different from the one over Skype, and different from the one in person. I remember the first time we met. I remember what I was wearing and, a couple of months ago, when I gave up on holding on to those black skinny pants from H&M, I thought of you, of course. I remember our first kiss and how I left my umbrella in the cab on the way over to your hotel one rainy night in Montreal. Rain has been a constant in our relationship. Rain and my feelings for you. I remember our New Year’s 2010 spent relatively together via text messages, each in front of a fire place, saying “I love you” more times that I can remember, hoping for a great year together. In the beginning I was amazed how you can possibly think that I am attractive, considering how attractive you were/are. I was baffled about the attention that I was receiving from you, about the interest you showed in me. I guess now I can say that my vision was clouded. Love is blind, isn’t it? Love makes you close your eyes to things that you just don’t want to see. And then, when finally you start seeing some things that you didn’t want to see, you start talking yourself into believing that they are not real, that it is your reality that’s real and perfect, and just the way you wanted it. Of course I remember my first visit to Vancouver during the Winter Olympics 2010. I remember the perfect weather, the perfect time we had, the perfect Italian restaurant in Steveston that we went to for my birthday, the perfect drive to Whistler, the perfect you, the perfect everything. If I wasn’t already falling for you at that point, I would have had started it then, for sure. But I also remember my decision to move to Vancouver less than a month later, in spite of all my friends (and without my family even knowing it!) disapproval looks, talks, emails, etc. No matter, as my mind was made up. High on endorphins, I guess. So here I was, packing my life, once again, in two pieces of luggage, buying a one-way ticket further West, and getting on a plane to live with you, Mr. B. I truly believed in your forever. And, to be fair, I believe that, at the time, you believed in it too. What I don’t want to remember, but still do, are the fights, the nagging, the disagreements, the difficulty of making plans together, “my” job quitting. Don’t get me wrong, I also remember all and each of the great times we’ve had together, and right now it is still very difficult to find a place in and around Vancouver that does not remind me of you somehow. I remember Pemberton, Bowen Island, Victoria, Whistler, Grouse Christmas Village, and so much more. I remember being a friend, a step-mom, a dog-owner, a cook, a girl-friend, and everything in between with you. I was so much when I was with you. I would dare to say that I lived much more during the time we were together that it actually lasted. And, as much as I would love to believe that it has been forever since I’ve known you, we have been together, really, for a little more than one year only. This is my own personal proof to support Einstein’s theory of relativity. I thought I was ready to say good-bye to you a long time ago. I thought that moving out of the house we shared will do the trick. It didn’t. I thought that dating someone else for a while will do the trick. It didn’t. I thought that you dating someone else (more than once) will do the trick. It didn’t. I thought that you ignoring me for periods of time will do the trick once and for all. I guess it didn’t. So here it is, my last resort, a letter of closure, a letter of saying good-bye to you, even if it’s unsent. Good-bye, Mr. B, with all my heart still. Maybe one day. and love beyond my fear. 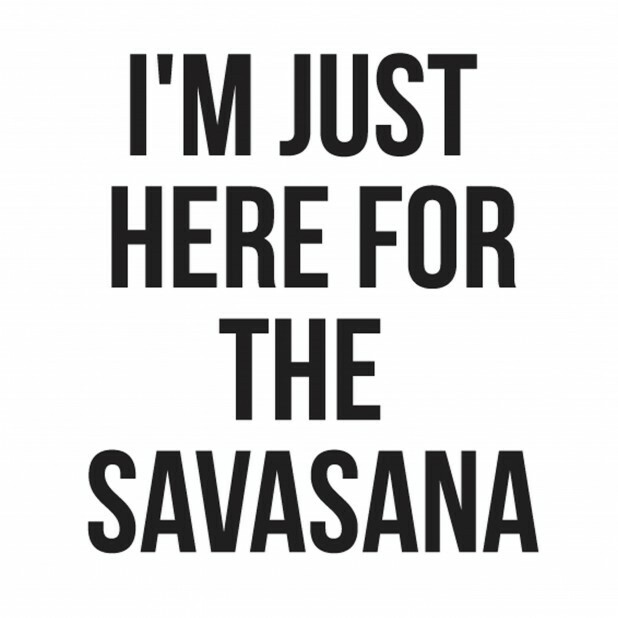 Yoga is my religion and savasana is my own form of prayer. I do not have to do it daily. It is always there for me when I decide to come back to it. I can do a 30-day challenge and it feels like lent preparing for something bigger and better afterwards. I do not understand it, but spirituality is supposed to be something beyond understanding. There is calmness. And there is strength. When I lay down in the corpse pose, all I can think of is gratitude. I am not asking for anything, but only giving thanks for what this body and mind is able to do. I just return to being me, honest, truthful, sad, lonely, warm at heart, yearning for companionship but searching for solitude, and everything in between. I return to myself. There has been a one-year gap already, but I believe that I have many things to say. I run into beautiful and inspiring people in my life for a reason: Luca Fogale, the musician who plays during our hot yoga music classes, and Pauline Caballero, who just started writing a blog, just to name a few. I think my creative talent lies in putting together two different ideas to create something new, either in writing or crafting. Luca asked to read what I’ve written. Pauline inspired me to take hot yoga, running, doing the Grind, and now blogging. So, dear WordPress, there must have been a good reason for us to meet. I’m glad I ran into you and I am willing to share my deepest thoughts, fears, and hopes with you. Take good care of them, will you?